The second dish of my cooking adventure is also a dish that I learned to make at Phuket Thai Cookery School, this time a dessert. 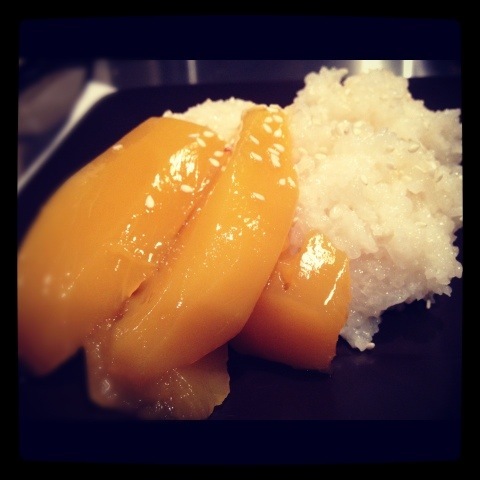 Khao Niew Mamuang or Mango with Sticky Rice is the Thai equivalent of rice pudding, with a sweet, creamy and slightly salty flavour. I’m a rice pudding lover from way back, so ate a lot of this during our visit. The fresh mangoes in Thailand are amazing, probably the nicest fruit I have ever eaten. Unfortunately in New Zealand we only get imported Peruvian mangoes that don’t taste anywhere near as nice, so I’ve substituted fresh mango with tinned – you can get Thai tinned mango at Asian supermarkets which is almost as good as the fresh ones. You can cook this rice in a double boiler or bamboo steamer with some cheesecloth/muslin lining the bottom so it doesn’t stick. 1. Soak the rice. Wash twice and drain. 5. Serve sprinkled with sesame seeds and slices of ripe mango.